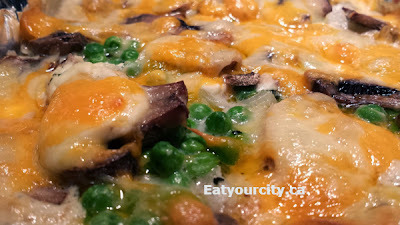 Eat Your City: Lazy Loaded Stuffed Potato casserole recipe - with your choice of toppings: mushrooms, cheese, bacon...! Lazy Loaded Stuffed Potato casserole recipe - with your choice of toppings: mushrooms, cheese, bacon...! 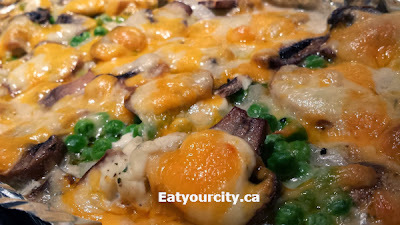 Posted by When I'm feeling lazy, I love making lazy loaded stuffed potato casserole. Its essentially mashed potatos with all sorts of good stuff mixed in, pile on all sorts of good stuff on top and toss in the oven until all the cheese and toppings make a yummy molten ooey gooey mess of delicious madness. Like I said, this is really easy. Preheat oven to 350F. Wash, peel (when I'm really efficient/lazy and I leave the peel on) and chop up about 2-3lbs of potatos into one inch or so cubes (keep it uniform in size so all the potatos finish cooking at the same time), ease into a pot of salted boiling water and simmer for 10min. Drain. Bake for 10-20 min until the toppings are all nicely toasted and the casserole is warmed through. 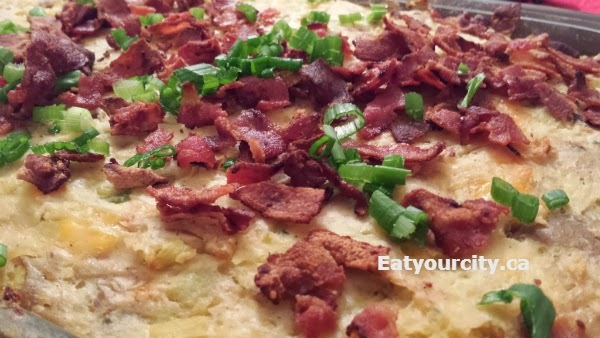 Top with additional bacon, green onions or chives Dig in!